WD: In 1970 you took your first trip to Greece. WB: Yes, but the Greece I saw was not the Greece of the history books or the Greece of the museum treasures, it was Greece at my feet. It was a landscape of fragments, all in shambles, or in the process of reconstruction, shards, and memory, and remnants. Fragmented forms have long been present in my work, and there was something quite moving about all that was strewn upon the ground there. You pick up a rock, or is it a rock, it’s a piece of something, a few indecipherable marks upon it, defaced and yet embedded within it the human presence. There is a 20th century appetite, a fascination in creative process. In the later works of Michelangelo, in particular of the emergent slave, the work, apart from whatever else, is a metaphor for the creative process. Those later works are complete, but the process is left visible, the summoning of the forms from the stone. In the Sistine Chapel it seems natural to me that as a sculptor, Michelangelo, in his depiction of the creation, would conceive that God create man through the power of his touch. 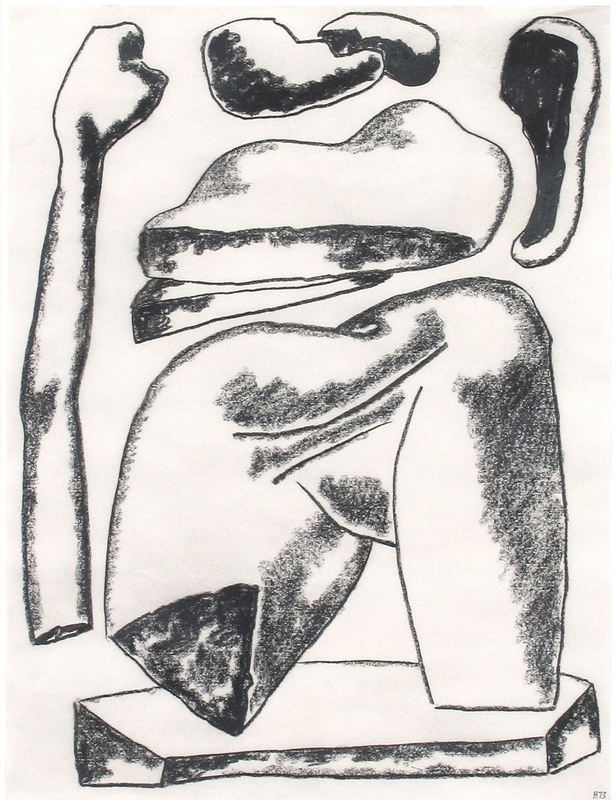 Untitled, 1973, Compressed charcoal on paper, 24 x 18 in. 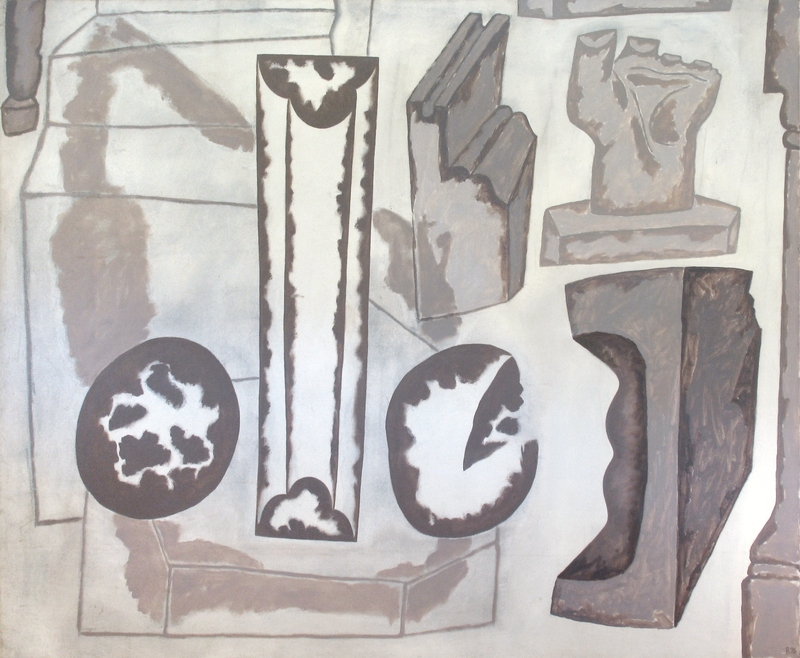 Untitled, 1976, Oil on canvas, 56 x 68 in. WD: How did Greece affect your work? WB: Although the exposure at first hand to Greek art and architecture moved me, it was the visual phenomenon of Greece which had the strongest impact. I can remember a particular day—I was looking at a distant island. It appeared as a great sea blue shape almost indistinguishable in color and substance from the surrounding water. It was as though the sea itself had risen to become an island. Later in the mid-morning light the island’s surface appeared as a dazzling pattern in high relief which was echoed by the shimmering of the cresting waves which surrounded it. By high noon that same island had seemingly dematerialized. It had become transparent, a veil floating gently over an immense expanse. In the late afternoon a halation of light projected the island’s dark silhouette. It had assumed a dense solemnity, an awesome weightfulness. Still later in the glowing of an expanding sky, it slowly merged with the darkening waters and disappeared. I think that these experiences helped me clarify my ideas and develop the visual properties of my current work. They certainly heightened my awareness of transformative value. WD: Do you try to capture variations? WB: Not so much the variations but the feelings I had about them. We all remember times when we’ve felt smaller than our actual selves, or larger, or more solid, or more permanent, or more or less familiar to ourselves. There is a part of painting that I am convinced has to do with confirming that we really exist. WD: Reflects us back at ourselves? WB: Yes, but newly revealed by a consciousness of relationship. CL: Since you and Wendy spoke, you made a woodblock for Crown Point in Kyoto. I understand that it was your first trip to Japan and first woodblock print, and I wondered if the reality of the experience coincided with what you had anticipated? 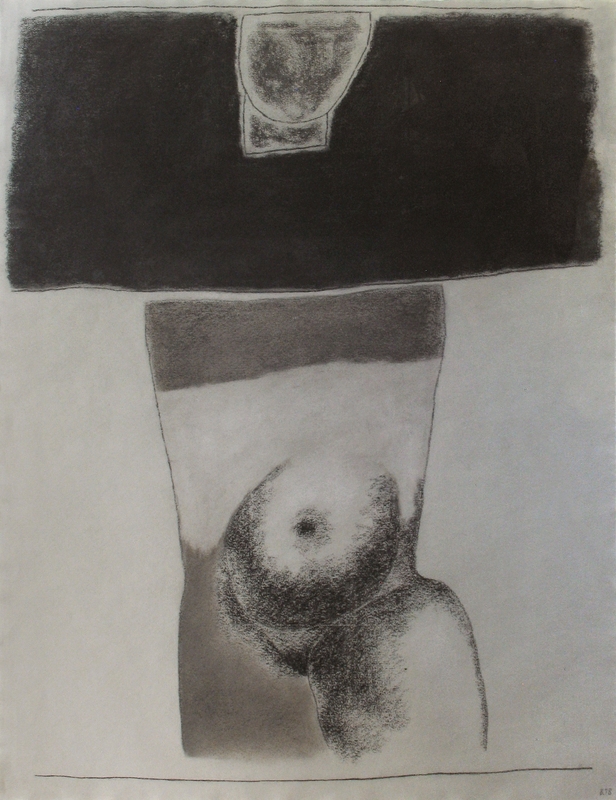 Untitled, 1978, Compressed charcoal on grey paper, 25 x 19 in. WB: I didn’t have a clear anticipation, but I had admired Ukiyo-e prints for a long time. I tried to imagine what I might be able to do in the medium. I made a distinction between Japanese woodblocks and German woodcuts. The German have a physical force, a directness of cutting, immediate and brutally vigorous. The Ukiyo-e printing is an art of refinement, of delicacy of feeling and sensation involving subtleties of color and value, yet the images are often extremely assertive. In the woodblock I made I expected the process to influence the character of my imagery. CL: Does the imagery in your print, Kyoto, differ from your work in other media? WB: Yes, in that the elaboration of the patterns within the rock forms tend toward a greater illusionism than is usual in my work. However, the landscape as a whole is not consistently illusionistic. Forms do not adhere to a ground plane. I see it as an image of suspension, an apparition in which the mountain, waterfall, and all the rock forms float in space. CL: Are you saying the process affected the imagery? WB: Yes, I think so. One of the things Takada emphasized was that the technique involves water-based inks, which contributes to the subtlety and transparency of the medium. In that way, the technique is different from color etching. And it was also different in terms of collaboration. When someone else is doing the carving of the blocks, there is another sensibility involved; it becomes a translation of what the artist envisioned. When I was working on the image upon which the print is based, I had many ideas before I arrived at the final one. I worked in transparent watercolor and I was conceiving the image as a block print. CL: You sent a collage? WB: Yes, but I didn’t intend it to be read as collage. I found it was the best process for me to use to arrive at my idea. And I don’t think when you see the finished print you think of it as collage. But, the particular way in which the forms are released from the field is in part due to my use of collage. CL: There is a feeling of fragmentation. CL: As you were working on it in Japan? WB: As I was working on it. At a very early point I felt (and I was happy that Takada and Mr. Toda agreed) that now that we have the woodblocks, let’s deal with them and not be limited by my original collage. All of the color in the final print, with the exception of the blue pattern of waterfall, was not in my collage.